The Marcum LX-7 Ice Fishing Sonar System is an impressive tool. All the details about using this unit are available in the box. There are USB ports which you can use for storing information. Color palettes selection make it easy for you to choose the best one. LX-7 is highly sensitive to temperature and gives you best battery timings. By using a fish finder, you can go ice fishing without any hassle. The Marcum LX-7 Ice Fishing Sonar System Fishfinder is loaded with features which make it a fantastic tool. This unit is better than its competitors in many aspects. Marcum took fishing to a whole new innovative level by making it simple. Beginners can easily use this fishfinder with perfect screen size as compared to other units available in the market. Not only large screen but also perfect resolution. It is a highly flexible tool which contains a wide range of settings for making this unit suitable for your need. 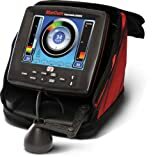 The Marcum LX-7 Fishfinder contains a large screen with 800 x 600 pixels with an incredible resolution. You can easily read the display and customizable display. There are multiple windows for underwater which includes a widescreen graph, circular flasher, and vertical zoom. There are almost five windows available which can be used underwater. You can easily target the sonar and return it to a transducer that can be displayed on the LCD screen. Sonar of LX-7 is powerful enough to penetrate at deep depths. You can monitor excellent targeting the fish by using LX-7 Sonar technology. Target the fish and view it in depth. Marcum LX-7 offers you a wide range of settings which allows you to choose from wide range of combinations. There are certain options that can display on the screen including battery voltage, target adjusts, interference rejection and digital depth. Color palette settings are also available which there are four different color schemes. Color settings can be manual and automatic. You can zoom the object for exploring in the better way. The software can be upgraded for enhancing the performance of the tool. Upgradation allows you to use the latest technology and discard traditional one. There are three angles available in which you can choose from including 8-20 degrees. You can adjust the settings of the unit according to your task so that you can get the best results. You can recharge the batteries for using it later. Targeting also makes it an efficient unit. You can set the settings of colors manually or automatically. Upgrade the software for using the latest technology. Therefore, Marcum LX-7 Ice Fishing Sonar System is a perfect choice.